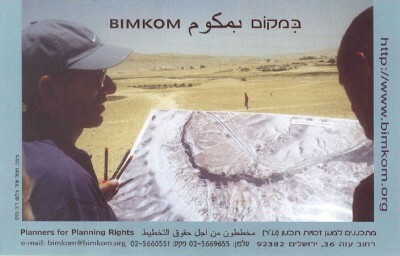 On June 13th, 2013 Bimkom filed our objection to Regional Outline Plan 4/14/65 for the Southern Region, which concentrates all the Bedouin population from five major different locations to a single locality in Har HaNegev. The objection is on behalf of a number of residents of two of the existing farming villages and was prepared together with ACRI. The plan proposes to recognize the existing settlement area of Ramat Tziporim and to transfer all the rest of the Bedouin population to there. Since this provides some answer to the needs of the community at Ramat Tziporim, the objection does not negate their recognition, but rather suggests settlement solutions and recognition in their current locations for the residents of Avda and the Chava Triangle, as farming communities. A major contention of the objection is that even though most members of all five communities are part of the large El-Azazme tribe (the claim made by the plan to explain the concentration of them all into one settlement), they have developed separately, and each have their own social, cultural and historical background. This has been clearly demonstrated, as Bimkom intensively studied the two communities, and the rest of the Har HaNegev communities to provide the professional basis for the objection.